FERGUSON, Mo. -- Police and protesters clashed briefly Thursday night in Ferguson just hours after the St. Louis suburb's police chief issued an apology to the family of Michael Brown. The black 18-year-old Brown was shot dead by a white police officer Aug. 9. 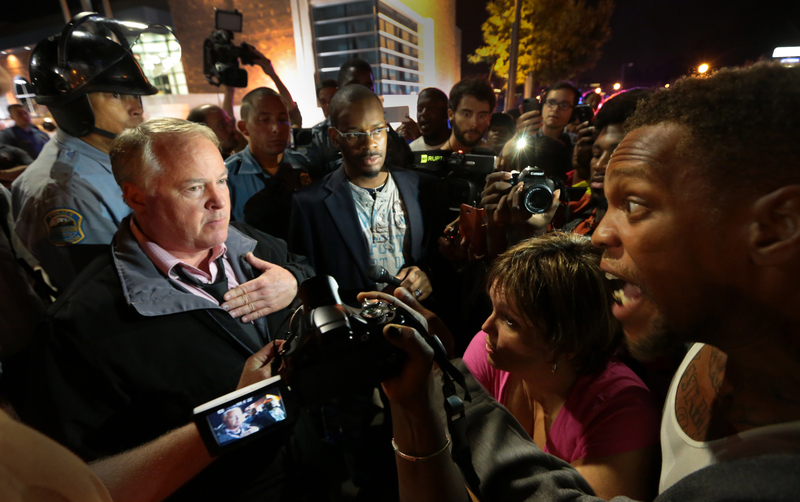 The St. Louis Post-Dispatch reports that Ferguson Police Chief Tom Jackson appeared outside the police department in civilian clothes late Thursday and assured protesters that there would be changes in the wake of Brown's death. Jackson started to march with protesters around 11 p.m. A scuffle broke out about 20 feet behind the chief and one protester was arrested. The newspaper reports at least three more protesters were arrested after a confrontation. Earlier Thursday, Jackson released a video apologizing to the family and the community, acknowledging that Michael Brown's body remained in the street for too long after he was killed. "I want to say this to the Brown family: No one who has not experienced the loss of a child can understand what you're feeling. I am truly sorry for the loss of your son," Jackson said in the video, which was released by a public relations agency. It all came as Brown's parents were in Washington, pressing for a full federal investigation into their son's death. A state grand jury is considering whether criminal charges are warranted, but a decision isn't expected for several weeks. Brown was unarmed when he was fatally shot Aug. 9 during a confrontation with Officer Darren Wilson, and his body remained in the street for more than four hours. At the time, police said they needed the time to gather evidence from the street, Canfield Drive, which is lined with apartment buildings. Wilson has been on leave since the shooting. Brown's parents declined comment when told about Jackson's video during a news conference with civil rights leaders at the National Press Club. Their attorney later said they hadn't heard about the video but would review it. The shooting of Brown, who was black, by the white police officer sparked racial unrest and numerous protests in Ferguson, including some that turned violent and involved looting. Some residents and civil rights activists have said officers were overly aggressive, noting their use of tear gas and military-style vehicles and gear. The responding officers included Ferguson police and St. Louis County police. In the video (see below), Jackson also apologized to any peaceful protesters who felt their rights were violated. "The right of the people to peacefully assemble is what the police are here to protect," Jackson said. "If anyone who was peacefully exercising that right is upset and angry, I feel responsible, and I'm sorry." He also acknowledged that "pain and mistrust" existed between the African-American community and police. "It is clear that we have much work to do," Jackson said. The U.S. Department of Justice is looking into possible civil rights violations. On Wednesday, investigators with the agency's Civil Rights Division hosted a meeting in Ferguson to allow residents to express concerns about police. About 300 people attended the meeting, including many who met individually with investigators. Many said afterward that they shared stories of police brutality and harassment.